Fall is legitimately here, my friends. Each day starts in the 40s (though in Oklahoma, we're back up to 60 by noon). People are cooking up big batches of chilli and singing about pumpkin spice everything. I decided to go against neutral fall clothing expectations and put on the brightest pair of pants I own. I don't know if it works or not, but I convinced myself with a gray cardigan and booties it was liketotallyfall. Like, totallay! But no seriously, it works. Plus the dark background for the floral helps. I really, really love those pants! I love that print! And I love florals for fall. This is a great look! 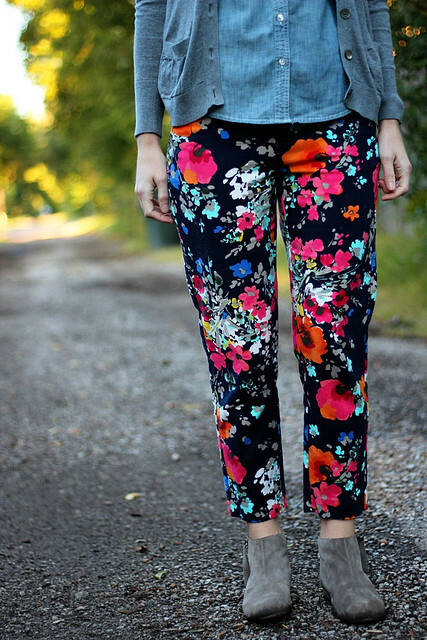 A pair of floral pants always works! Love your bright ones! Even I have a pair of floral pants and I loved wearing them with a white top and denim shirt. Oooh I am such a sucker for a good pair of floral pants! LOVE these! You look so cute :) We still aren't experiencing liketotallyfall weather here yet, but hey. It didn't stop us from making chili last night! 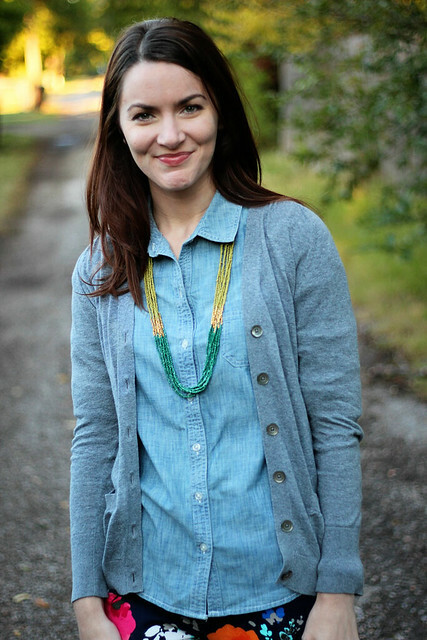 I really like that you layered the chambray top with a cardigan! Love! I hate following the seasonal fashion "rules" or expectations. If you want to wear flowers or white in the fall then go right ahead and do it, at least that's what I say :P Your super bright pants look awesome and you look so happy in these photos! I love your floral pants! You look super cute! you are so cute! I just found you through the pleated poppy and I adore your blog! 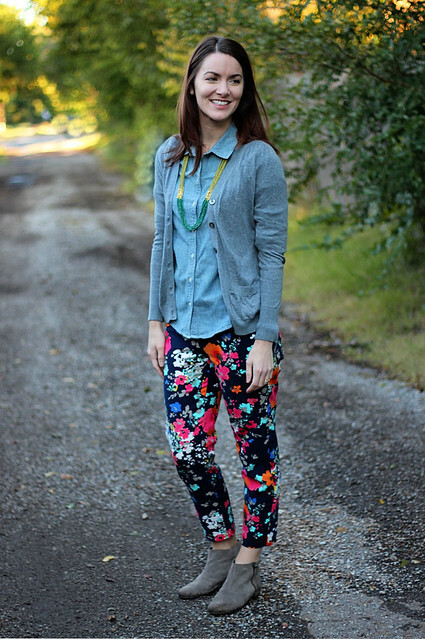 i'm loving your floral pants and booties together!! and it's definitely feeling like fall! I think you pull it off, the base of the pants is black after all! I've been really into printed pants, and I think now that it's getting colder I'll be wearing them much more! Adorable fall outfit! I love it! I am a firm believer that brights are a must when the weather turns cold and gray. 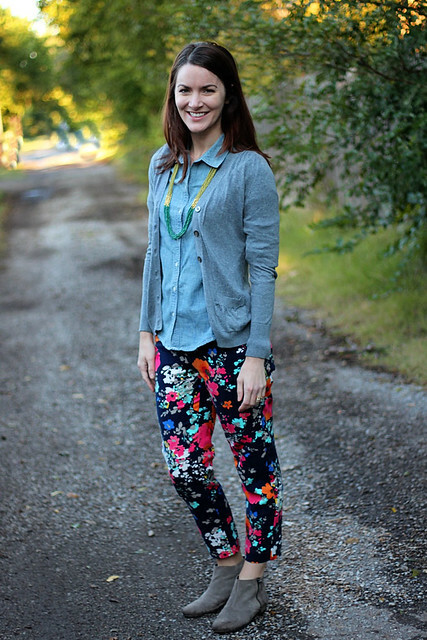 I absolutely love the way you took your fun floral pants and made them "liketotallyfall" Super cute! Same here! NY is finally getting chillier now, in the 40's ;) Can never have enough chambray, love them! 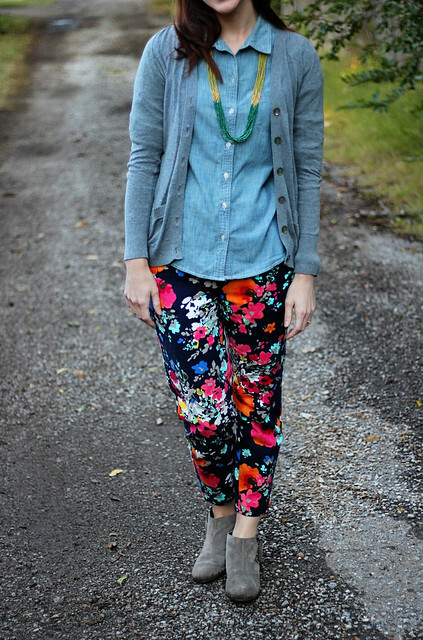 And those floral pants are so lovely chic, can brighten up any day! 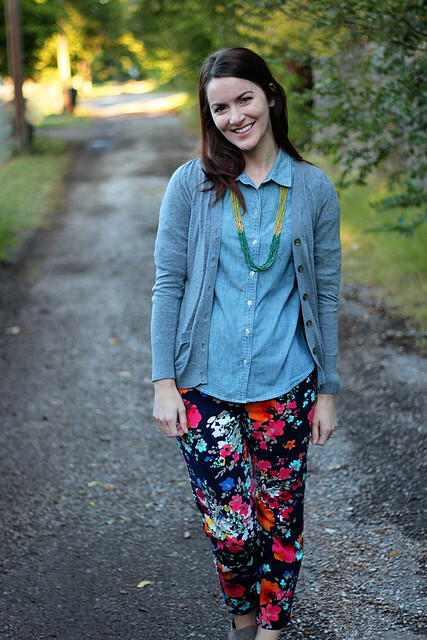 You totally rock the bright floral pants. Plus chambray is awesome. Great fall outfit!!! haha i think you TOTALLY look llike fall! and those are some PANTS girl, i absolutely love them! and i love that you decided to keep everything else neutral. it looks so stinkin good. I love this look! Great pants! Love the print on those pants! They look so good on you! adorable outfit. love those booties, definitely a fall staple! !